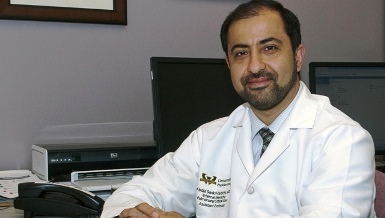 Wayne State University School of Medicine sleep researcher Abdulghani Sankari, M.D., Ph.D., has been awarded an unrestricted $40,000 Research Award from the American Thoracic Society Foundation, which he will use to establish a new animal model of sleep disordered breathing, or SDB, after induced spinal cord injury. The new model could identify new treatments that can be translated to humans. The ATS Foundation is the philanthropic arm of the American Thoracic Society. "Animals will be tested during sleep after they undergo C2-hemisection or sham surgery to identify SDB using telemetry recording to mimic polysomnography in humans. Animals that develop SDB will be given experimental drug that has potential for treating sleep apnea in this animal model," he said. Dr. Sankari is an associate professor of Internal Medicine and director of the Division of Pulmonary Critical Care and Sleep Medicine fellowship program.